Yesterday a user reached out to us, and wanted to know if the result she had received from our Skin Image Search™ were correct and if it could be trusted. She had gone to visit her 70 year old father and she saw that he had some new skin lesions on his nose. Since childhood they have enjoyed vacations on the beach, skiing in the mountains and her father has alway loved working in the garden during the summer. They have Nordic origins, so they have fair skin and burn quite easily in the sun. She gave Skin Image Search™ a try, and got a 5 ranked result of possible skin conditions (see the image above). She got concerned, because it indicated that it was Actinic Keratosis which is a pre cancerous lesion. She then wondered if she should go to see a dermatologist in person. I told her, if she was still unsure that it could be Actinic Keratosis she could ask our online dermatologists and have an answer within hours… However, she did not want to pay for an online visit, but instead chose to see a dermatologists in person…. The only problem is that there is a 3 months wait. How accurate is the Skin Image Search™ algorithm? 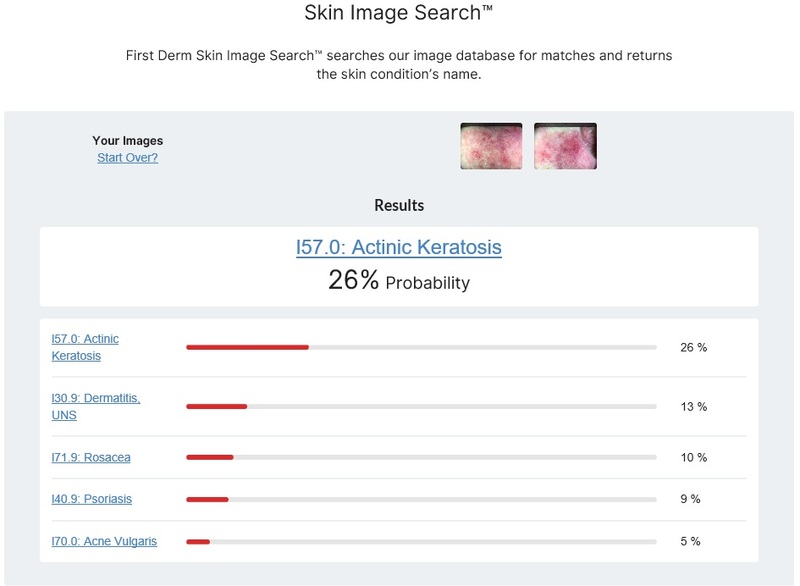 Skin Image Search™ current algorithm has been trained on 33 different skin diseases, where it is 40% correct on one skin disease class and 80% correct on the top five skin disease classes (differential skin diseases). Skin Image Search™ is currently not as good as a dermatologist, but better than many non-dermatologist physicians. It should be used as an informational guide on skin diseases and it does not replace a dermatologist. However it is much better than a random internet search to help guide you to relevant health information about your or a loved ones skin condition.